Home SKINCARE Tatcha Blotting Sheets Review and Giveaway! Tatcha Blotting Sheets Review and Giveaway! I have for you another review and giveaway! A few weeks ago, I was given the opportunity to review a new product - Tatcha Blotting Sheets. This product just made its release to the US on September 16th. When I am contacted for a review, I like to make sure it's a product that is relevant for me...something I'd actually like to review and use. In my makeup kit...I always have oil blotting sheets. It's a must-have for touching up makeup. I prefer these over powder since you can remove oils without having to cake on more and more product...which would lead to clogged pores and breakouts. Not to mention, clients don't look very pretty after about 5 layers of powder. I also like to include a blotting sheet for brides to be in their complimentary touch up kits. The company sent me 3 different packs to test out. Each pack had a different color, but they're all the same. I laid out the 3 packs on my coffee table. First off, the packaging is really nice. It's a nice cardboard container which reminds me of an item you might see in a gift shop. Each pack contains 30 large sized blotting sheets. Here's a promo image from the company. You can see the Japanese figures on the picture...very cute! The package provides detailed instructions on the back. Abura-tori-gami means “oil blotting paper” in Japanese, but refers specifically to handmade abaca leaf papers used by gold leaf artisans. This 300 year old beauty secret of the geisha comes from the heart of Imperial Japan. For centuries, gold craftsmen in Japan have used special handmade papers to protect the precious metal they hammered into whisper-thin leafing to enrobe the majestic pavilions of Imperial Japan. Their gold-leaf artistry transformed the supporting paper into aburatorigami, an incredibly soft, strong and absorbent leaflet ideal for removing excess oils from delicate skin. You can see the little flecks of gold in each sheet. I always like to test out a product on myself before using it on clients. 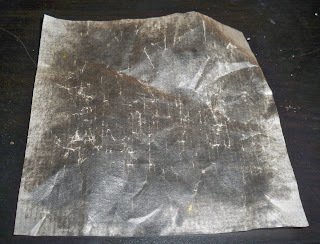 I was happy to see that I was able to use the entire sheet to absorb the oils from my face. Oftentimes, you'll need 2 or more sheets from the typical card sized pack of absorbing sheets. The gold flecks don't transfer onto the skin...I'm not sure if they do anything special, but they look pretty! The oil sheet is actually very sturdy so you don't have to worry about tearing or puncturing it. I used this on two brides after makeup was applied...and it was able to absorb shine without disturbing the makeup. Like I said, I only needed one sheet to do the entire face...and you can use both sides. To celebrate the arrival of TATCHA aburatorigami to the US, the company is generously giving away 1 complimentary pack of TATCHA to five Makeup By Ren Ren readers to try for themselves. U.S. based readers only please, as they not yet distributing internationally. I will announce the winners tomorrow! Good luck! 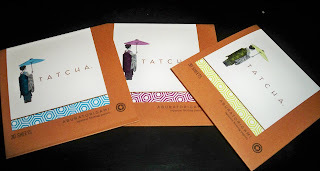 You can find more about TATCHA aburatorigami on their product page: Tatcha aburatorigami — Japanese blotting papers. These will be handy since I live in the south! Thanks Ren! I actually have Tatcha. Its awesome and works really really well. I like that the sheet is big enough so that I only need one sheet for my face. I also like that I can use both sides of the sheet! Wow, living in the desert heat, this would be awesome! I would definitely love to try it out and see how well it works! I'd love to win these. Constant powcering can result in a cakey look. Not cute. I get so oily that I can blind folks coming my way. LOL! This is going to be handy since I live in the South and have oily skin. Thanks, Ren! Well, I live in Texas in this humid, hot weather and my face is always oily after like 10 minutes outside! I think these will come in handy :) I think it would be awesome to try out! Hi my name is Janee'. I'm a makeup artist trying to build my portfolio. I am spending far too much money on makeup and would love to participate in giveaways and reviews. I like in Los Angeles CA and I'm a follower of your blog. I just started one myself called makeupvixen on blogspot. I worked for MAC for years and never tried the blot strips, I would love to try these out. I can't buy anything right now, I'm a single mommy of one with no financial help. My side job is doing makeup so any giveaways would help me a lot. My skin is so oily and living in Florida only makes it worse. I use a lot of blotting sheets, some of them work well and some don't. I love to try a new brand. Hey RenRen! I would love to try these out, I normally use the ones from Mary kay. but like u said some other bloting paper u have to use several,I also live down south and would be travelling to Africa where like the south its hot and humid. I've never tried it, so I would definetely see how well it works since I'm really oily! I would REALLY love to have these because I know over the years I have spent well over $300 on blot sheets that dont work that well. These are large and in charge and I'd love to see how they would work with my oil-slick/grease paint of a canvase I have. Lol. My follower name is NvrSettle btw. Omg, Oil blotting sheets are a must have in my purse at ALL times. I have oily skin and def agree on not piling on more product. I would love to give these a try because they are bigger than the normal one's and can be much better use to me. Thanks. Hey Ren Ren! I would love to get my hands on these babies! I have very oily skin and feel like I have tried it all! I also live in sunny south florida so unlike many lovely bellas who get to experience the beautiful seasons of fall and winter we get hot weather alll year round which also means MAKEUP MELT DOWN! ahhh! I would love to try this product. Even though it's fall in Cali, it still gets really hot! And when it gets hot, my skin gets super oily and shiny. AND I'm going to the philippines in about a month so what better way to keep fresh! this would come in handy for my clients that have oily skin. some times i have clients that arent always prepared as others and come with oily skin. so this product will definately help get rid of some of that oil. I have yet used a blotting sheet that worked well for my oily t-zone. Using 2-3 sheets at a time is such a pain so I'm sure this bigger than the normal size blotting sheets would be awesome! What a beautiful, unique story. I'd love to try these blotting papers! I never leave the house without a pack! I would like to win this item because I have oily skin and this would be perfect throughout the day. Thanks! I love blotting papers! I have tried all kinds, from the Boscia ones to the dollar store ones. The prob I have is that the tissues always break on me, not sure if I'm just using a heavy hand or what. The Tatcha ones seem very elegant, with gold flecks. I would love to try these! I have very oily skin and need some kind of relief. Hi renren! thanks for the giveaway opportunity...i love blotting sheets because my face gets so oily throughout the day...I go through a lot of blotting tissue, i'll be interesting in checking this product out!..thank you. I would def like to win these. It's getting cooler out, so they may not be used as often, but still would be nice to have in my kit. This would be awesome to try out... I just recently bought blotting sheets from avon and was not too pleased. I'm on the hunt for the best sheets and these sound like they rank!! Wow I could def use some of this. we Pinoys tend to get real oily. I am using a great foundation who really helps with oily face BUT it doesn't come with a matching awesome face powder..So I still get oily specially during the day when I am at work...win win win! Wow I could def use this. We Pinoy's do intend to get real oily. I use this great MUFE mat velvet foundation which is real good for oily skin people, BUT it doesn't have a very awesome face powder to go with it..So I still get real oily during and after a long days work!..win win win..yey Thanks Tatcha! Oh my god! This would be perfect for me. I'm a teacher, so the constant running around, and then moving from day to night outfits, this would be perfect for when I touch up my make-up before I head out. I hope I get it! Thanks for the giveaway Ren!! I'd love to try these out just to try something new & to help myself or anyone else in need! I am in high school so I'm running all around school with at least 1,000+ students everyday. Although the weather may get cold, it gets very heated as soon as I step in the building! I hate having to gently use my blotting sheets because I'm too scared it's going to rip! But these sound PERFECT! I need this product. My face is SUPER oily, so I would love to give it a try. my face gets extremely oily and i usually have to use 2 to 3 sheets so only using one sheet would be perfect for me! I would like to try this product because I have a friend who always thinks I'm wearing a ton of foundation because my face is shiny. IDK why he would think this but I just want to show him that my face is just shiny and I do have flawless skin without makeup. I have been on the hunt for a good blotting sheet for months and i think this one would actually work on me. I've tried blotting sheets from the drug store all the way to the department store ones and none seem to work the way i want them to. I would LOVE to try them!!! I hope i win! Hi my name is Jenny! I would like to try this product because I have very oily skin and I live in a hot climate (Florida). Trying to stay matte is a nightmare even on "cool" days. I don't wear foundation on a daily basis and I haven't found an oil absorbing product that absorbs oil well so it would be great if I was given an opportunity to try this product. Thanks Ren! I just find these so cute! Plus, I have really oily skin. During the busy school day, I could really use a blotting sheet that helps remove oil from my face opposed to using several sheets. LOL, big enough for your entire face wow! wonders if you could use it on other oily body parts. LOL! I love the fact that the sheets are large enough you can do your entire face with it. I hate having to touch up my makeup during the day by adding more and more powder to asorb the oil, I really don't like the cakey look. So I would love to try them. Thanks Ren!!! i would love to try out this product because i've never tried any japanese makeup related products and the only thing i've used for oily t-zones is powder. this sounds just dandy! thanks for hosting this contest! Hello. I would like to enter the giveaway. I am a textbook oily gal. I shine like a beacon and blotting papers are essential to maintaining my diva look daily. i wanna try this because i have greasy skin and suffer from breakouts sometimes! my face is SUPER OILY !!! I hate it, because it doesn't flatter my face at all!!! So having this will hopefully make my face less oily lol. I would love to try out this product, my face is always oily and I feel like nothing works. Hopefully this will change the way I look and feel about myself and not need to be self conscious if I am shiny oily and greasy. It would be awesome to try out a product that is actually good for your skin. The clean and clear blotting papers just doesn't do it for me. I need blot papers because I live in two humid places. I'm from Texas, but I go to school in Puerto Rico. And I'm always looking for ways to keep my oily skin at bay. It would be nice to try out a new product. I have oily skin and always have to blot my face. Would love to try this product!! nice review :) I'd like to try this because I'm always looking for an effective blotting sheet - I hate having to use 2-3 sheets just to get the job done! I want it for the cover.. it's so gorgeous! =) I have never heard of them before..it'd be a great product to try. wow! perfect for the oil mine of a face that i have. hope i get to try it out! I love the fact that it is one larger sheet. My skin always tends to get oily and having to use 2-3 sheets takes so much time. One large sheet would definitely help in the oil blotting process. OH...and I love the geisha on the front! I have freakishly oily skin, so I think these sheets would really be helpful in keeping the oil away. I used to use blotting sheets (I forget the brand) but they were so small and were only able to be used on one side; def not worth the money. I love how these sheets are so much bigger! I'd love to try these since I live in such a humid climate! Thanks, Ren! This would be something new to try since most of my money goes to makeup instead of products that help decrease shine (because I have really oily skin) I think this would be a perfect opportunity to try something new. Using normal blotting sheets, I have to use two or three at a time. I would love to try one that can do it in one sheet. Plus I am a fan of Japanese made products. They always seem to make things logically and better. I would love to try these! The packaging is so beautiful. I have another (different) pack of blotting papers from Japan that i'm afraid to finish up because the packaging is so cute. Stupid, I know. The oil field that lays on my skin needs some blotting sheets! ren, how do i find you on facebook? Friday Giveaway Sponsored By Q-Tips!